Broadcast journalist Edward R. Murrow looks to bring down Senator Joe McCarthy. 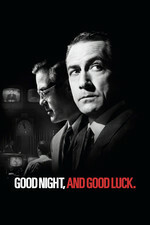 "Good Night, and Good Luck" dramatizes a key moment in the history of television news, the standoff between newsman Edward R. Murrow and red-baiting Sen. Joseph McCarthy. In the course of three broadcasts in 1954, one of which McCarthy had all to himself, Murrow went up against one of the most powerful and feared men in the country and, by assembling facts and using the senator's own statements against him, more or less took him down. Those three episodes of "See It Now" marked the beginning of the end of McCarthy's influence in America. Yet in the midst of what is widely considered an exalted period in TV news history, undermining changes were taking place on the network level. The movie dramatizes that, too – the beginnings of news as a money-making enterprise, as a ratings grabber, as a form of entertainment. Part drama and part civics lesson, "Good Night, and Good Luck" is an entertaining slice of American political and cultural history, enhanced by faithful period detail and energized by urgent parallels that George Clooney, as director and co-writer, wants to stress about the present day. This is an ambitious, and personal, work of Clooney's, whose own father, Nick Clooney worked as a journalist, anchorman, and TV host. gorgeously shot in black-and-white (really just shades of grey) that ease the viewer into the cultural milieu of 1950s America. Impeccable hairstyles, dress, and set designs that look like we just time-traveled to the McCarthy-era. American jazz singer Dianne Reeves who serves as a kind of muse for the film, and mental breather. Ray Wise as Don Hollenbeck. The presence of big stars (Robert Downey Jr. and George Clooney) amongst less well-known, and therefore more anonymous faces, is jarring and takes one out of the story. Presumably they had to make the film more bankable but I find it's the weak spot of the film. "Precisely every 23 minutes (the standard running time of TV shows from the 1950s), the film is punctuated by a jazz song performed by Dianne Reeves." "Initially, the famous concluding catch phrase 'Good Night and Good Luck' that became the title of the film, was a habit Edward R. Murrow kept from his London years as a war reporter for the radio, when British people under constant night German bombing systematically ended their conversations with the very same words, uncertain to meet again." "During the DVD commentary for this film, George Clooney says that about 20% of the test audiences had never heard of Joseph McCarthy before and wanted to know the identity of the 'actor' playing him. McCarthy, of course, was played by actual footage of the real McCarthy: Joseph Raymond McCarthy (1908-1957), who was the Republican Junior Senator from Wisconsin from 1947 to 1957, when he died in office." Joseph McCarthy's influence was already waning when Murrow's show about him aired due to years of investigative reporting by other journalists, such as Drew Pearson. Edward R. Murrow himself said in Newsweek magazine, 'It's a sad state of affairs when people think I was courageous' in presenting his show. You may recognize: Patricia Clarkson from 1987's The Untouchables (FanFare), The Green Mile, the TV series "Six Feet Under" and "Parks and Recreation"; Matt Ross from The Aviator (FanFare); Robert Knepper from the TV series "Prison Break" and "Heroes". "I will not take on McCarthy and Hearst – I cannot defeat them both." If you have this on DVD, I recommend that you watch it with the commentary track on. It's quite entertaining, as Clooney and Heslov are old friends and tease each other a great deal. I saw this movie in the theaters and the moment I remember the best is the interview with Liberace. He's asked why he isn't married and he responds "Well, I guess I just haven't found the right woman yet." My friend and I were laughing and everyone else was completely silent. I was like "Really? No one knows Liberace?!" I have this one! I picked it up at Value Village for a few dollars one day. I watch it every once in awhile to motivate myself to become more politically engaged, because damn is the same sort of thing ever happening now. TIL Liberace sued The Daily Mirror for libel for calling him gay, and won. Hmmm, maybe I should re-watch this. I remember thinking it was OK at the time but more earnest than artful. I wanted to like it. I liked the bold black and white aesthetic. But nothing really got to me about it. On the George Clooney front, I was just finally watching Ocean's 11 and I was laughing at how he always does this thing, since ER, where he tilts his head forward and looks up at you from under the tops of his eyelids, as if looking over a pair of invisible reading glasses. Once you start noticing it you can't stop. That thing with his eyebrows? He's been doing that since E/R (the dramedy). It's one of his signature acting moves, although it looks much better with short salt-and-pepper hair than his 1980s mullet.... This clip has him doing it with sunglasses. More earnest than artful is a good way to put it, though. A great cast, a good story to highlight history (despite some inaccurate framing), and high production values including the unusual grayscale filming method. But it just doesn't gel dramatically. I wasn't impressed with Clooney's role here although Daniels and Downey did fine.